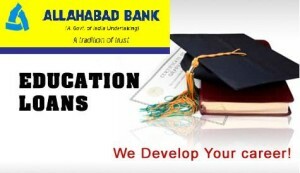 Education loan in India – get education loan details from Allahabad bank and how to approach techniques. Know about Eligibility criteria, education loan interest rates in Allahabad bank, requirements & document required. Also find the loan details of maximum amount, Courses which are eligible get Study loan. Full details are given below,. To provide financial assistance for students who study in India and abroad. Student should have acquired admission for courses in India/abroad through entrance test/selection process. Usual Degree/ Diploma Courses – Aeronautical, Pilot Training approved by Director General of Civil Aviation/ Shipping Approved courses offered in India by approved International Universities. For UG: Professional/technical courses offered by reputed Universities. For both studies in India/abroad Rs. 20 Lakhs. Loans up to Rs. 7.5 Lakhs max of 10 years.